If Citigroup is too big to fail, isn't the state of California? How the national economy can snap back to health if the federal government refuses to help? 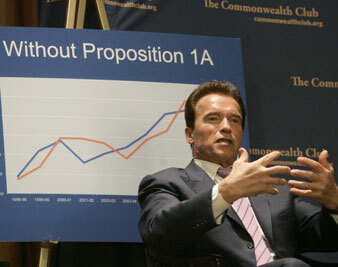 California Governor Arnold Schwarzenegger during a speech on budget reform. All sorts of startling conclusions are being drawn about the failure of California’s ballot funding initiatives last week. Newt Gingrich hailed it as another Boston Tea Party, and New York Times columnist Paul Krugman insisted that it condemns California, one of the world’s largest economies, to banana republic status. But if it was such a big deal, how come the voter turnout was so low? I tried, and after reading the opposing argument in the literature supplied at my nearly empty polling station I voted for the ballot propositions that our governor, Arnold Schwarzenegger, had requested. I assumed that this would help our vastly underfunded inner-city schools. Later, my son Chris, who teaches in one of those schools, told me that I might have been wrong and that the convoluted paragraphs of the all too typically obtuse California propositions could not improve matters much at all. So, filled with doubt and guilt, I took solace in the fact that in terms of the money involved it wasn’t that big a deal, and that surely the feds, to whom we Californians send more in revenue than any other state, would bail us out as they have the banks. Heck, the entire projected California budget shortfall comes to only $21 billion, a tiny fraction of the banking bailout. Yes, only–what is $21 billion in federal loan guarantees for California to skirt bankruptcy compared with the $45 billion given to Citigroup, along with $300 billion more in guarantees for that company’s toxic paper? Or how about the $185 billion doled out to AIG? If Citigroup is too big to fail, isn’t the state of California? Does anyone seriously believe that the national economy can snap back to health if California is in the dump? The cause of California’s, and almost every other state’s, predicament is an economy ruined by deregulation policies that were secured by the lobbying efforts of Wall Street, led most prominently by Citigroup. So, I expected a federal government that has spent trillions salvaging the banks that got us into this mess to find the relatively minor sums needed to bail out California and other states that have been the victims of Wall Street’s dangerous games. Tough for whom? Not the politicians of either party. The results of such decisions are tough for the poor of America, two-thirds of whom are kids, left to the tender mercy of the states, thanks to the sweeping “welfare reform” and other programs put into place by the Clinton White House in one of that Democratic administration’s signature triangulation ploys. Bail out the banks, but not the 500,000 poor families with children served by the CalWorks program, which will be dismantled, or the 928,000 children covered by the Healthy Families program, slated for oblivion. At a time when the feds are spending with such abandon in an effort to stimulate the economy why is it tolerable to leave states in a position where they are forced to fire teachers? As the Los Angeles Times reported: “Schwarzenegger has proposed slashing state spending on education by $3 billion to help close the budget gap, and the state would pay dearly for canceling classes, firing instructors, cutting class days and shortening the school year, experts said.” How can there be federal funds readily available for banker bonuses but not to keep teachers in the classroom with their students? It must have been the kids who caused the meltdown.